Forgive Messud (The Last Life, 1999, etc.) for subtitling this set of novellas “two short novels,” and reject the impulse to make sense of the juxtaposition of two beautiful tales of people contending with solitude: each story succeeds in standing alone. Maria, protagonist of “A Simple Tale,” discovers blood-streaked walls at the home of Mrs. Ellington, a woman she’s cared for every Tuesday for 46 years. Maria expects the gruesome, but the old woman’s real plight triggers in Maria a flashing-before-her-eyes recollection of her own whole life, starting as a girl in pre-WWII Ukraine, moving to camps in Germany when the war arrives, and eventually raising an American-style family and growing old in Canada. Maria is a homebody akin to Evan S. Connell’s Mrs. Bridge—she takes guilty pleasure in a teacup left dirty overnight—and her story spills out, sadly and expertly, in one long breath of history and well-earned nostalgia, and Maria discovers that having a story is as important as telling one. 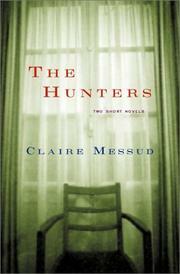 “The Hunters” plays a coy game by withholding the gender of a lovelorn American academic studying death in a disappointing London apartment for a summer. Messud recalls Henry James by sometimes opting for the pretty word over the perfect word (and she loves parentheses), and the story’s plot and subject echo those of The Aspern Papers. Sexless and nameless, the character is as difficult to reference as to pin down: the main action occurs when a downstairs neighbor, a gnomish woman named Ridley Wandor, who just happens to care for the terminally ill, repeatedly imposes unwanted friendship on the scholar, who in turn becomes obsessed with finding something evil behind her veil of friendliness. But beyond the screen is only a misplaced distrust and another lesson on how to be human and alone. As smart as they are affecting, these stories aren’t novels: it’s in their brevity that they loom so large.